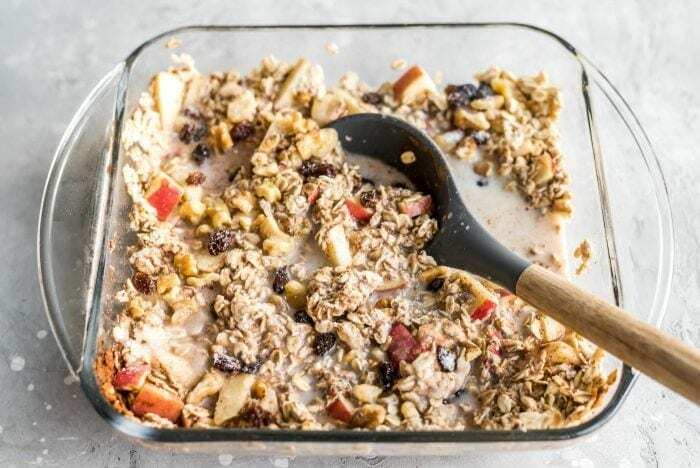 Mix up this simple, vegan baked apple cinnamon oatmeal, pop it in the oven and 30 minutes later you’ll be digging into warm, comforting, apple cinnamon oats. 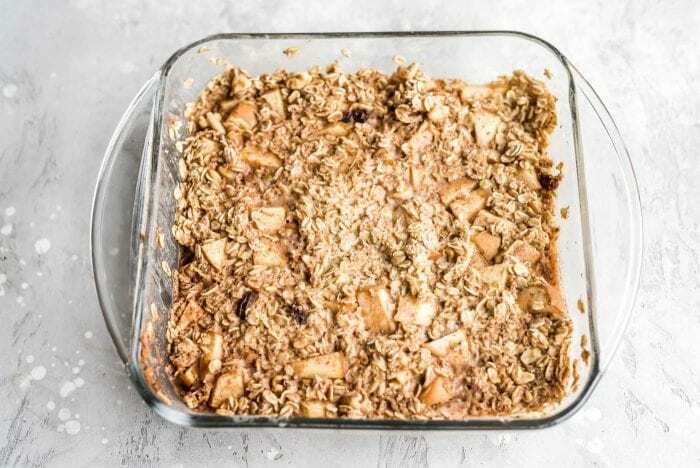 Walnuts and raisins are added to the mix for extra flavour and it all bakes up into a delicious and wholesome oatmeal bake that not only tastes amazing but will make your home smell amazing too! 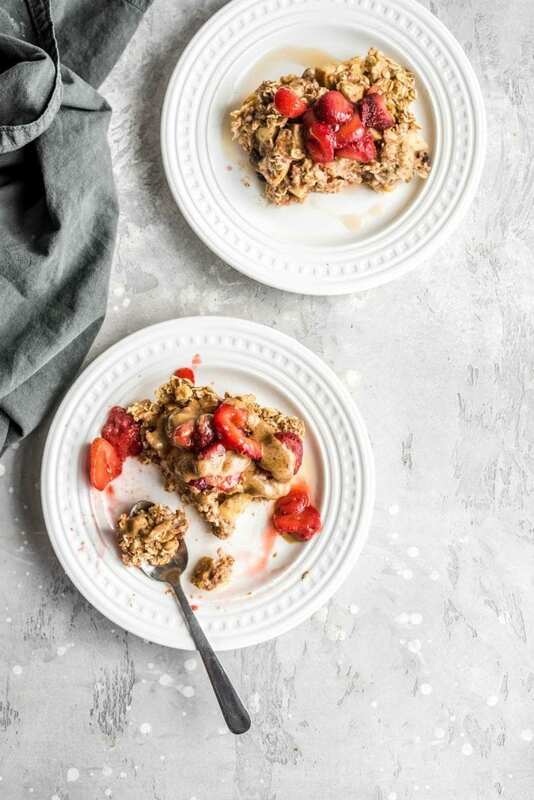 This recipe is much like my easy banana baked oatmeal. You only need a few basic ingredients to make it. Rolled Oats. 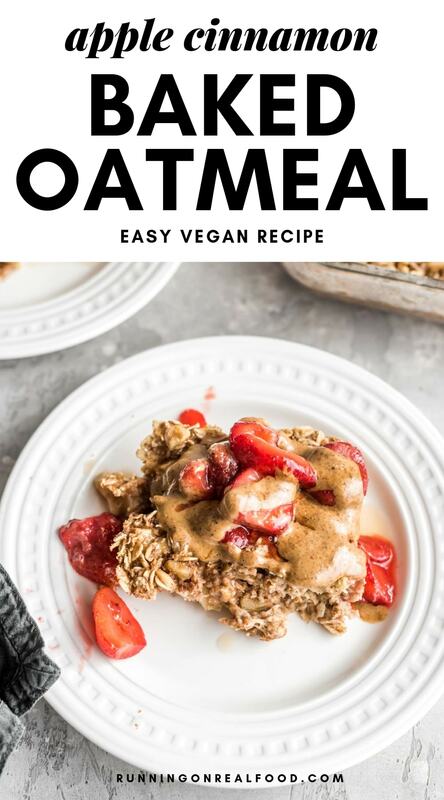 My favourite type of oat is large flake rolled oats but you can use any kind of oats in this recipe (except for steel cut oats – try my baked steel cut oatmeal for that). I would recommend sticking to rolled oats over quick oats or minute oats though as the texture will be much better. Apple. Any kind of apple works. Just dice it up and throw it in! Cinnamon. Apple cinnamon oatmeal needs cinnamon of course. I used 2 tsp but you could probably bump that up a bit if you really love cinnamon flavour. Ground Flaxseed. Ground flax acts a bit like an egg and helps bind the recipe. Chia seeds would do the same trick so feel free to sub those in or go with 1 tbsp of each. Walnuts. I add some chopped walnuts for extra apply-cinnamony-flavour. They’re optional and other nuts like pecans and almonds would also work well. Raisins. I added some raisins for a bit of sweetness and raisins always go with apples and cinnamon. Any kind of raisins will work. I used just 2 tbsp but feel free to use more if you want. Chopped dates or cranberries would also work here. Vanilla and Sea Salt. I add these too pretty much any sweet recipe for extra flavour. Sweetener. I would recommend adding a bit of sweetener to this since the apples don’t add much on their own. I like to use Lankanto Monk Fruit Sweetener or liquid stevia. 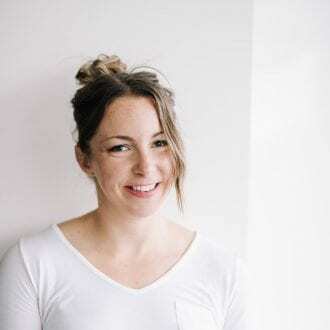 Coconut sugar or maple syrup also works. This simple recipe couldn’t be easier to make. Mix everything up in a baking dish, bake 30 minutes and it’s done. I love a slice of this before the gym in the morning and it’s great for quick breakfast or snack anytime too. 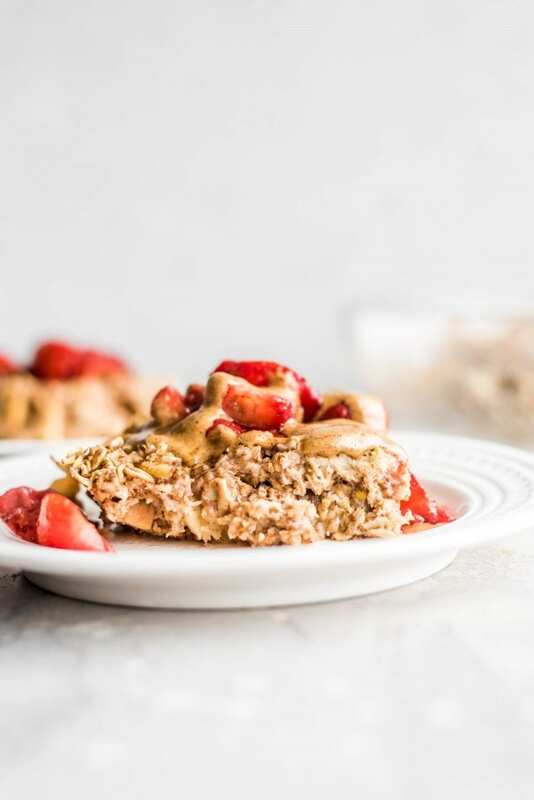 I like it topped with almond butter and coconut yogurt. Berries are delicious too. 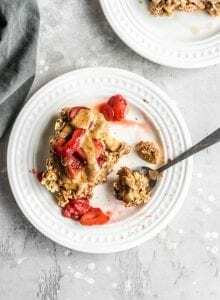 It’s super yummy and satisfying and also gluten-free, low-fat (leave walnuts out to further reduce), oil-free and has no added sugar (if you use a sugar-free sweetener). 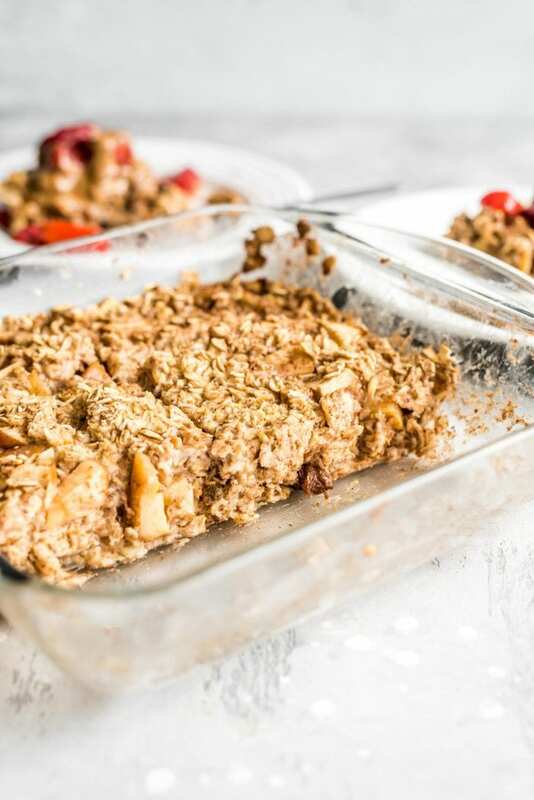 This easy baked oatmeal smells amazing, tastes amazing and is easy to customize with add-ins like coconut, raisins, nuts and seeds. Mix all ingredients in a baking dish (approx. 8×8 inch) and bake at 350 degrees for 30 minutes until firm and golden brown. Let it sit in the dish for 5-10 minutes, then slice into 6 pieces and carefully lift out with a spatula. 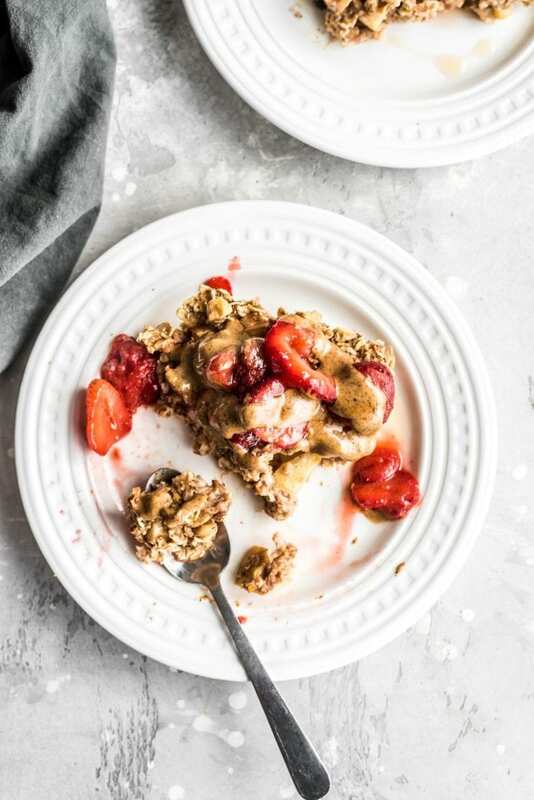 Enjoy plain for a quick snack or serve with toppings like berries, dairy-free yogurt, almond butter and a drizzle of pure maple syrup. Leftovers can be stored in the fridge for up to 5 days or frozen for up to 3 months.